egeplast HexelOne® SLM pipe is a self-reinforced high pressure pipe, a monocomposite only from polyethylene. This reinforcement enables new areas of application in the “raised pressure“ area, in other words, operating pressures above applications previously covered using PE pipes. 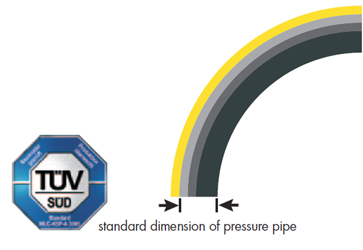 The reason: It indicates twice as high a strength compared to the previous PE pipes. More videos can be found in the egeplastube under https://www.egeplast.de/en/egeplastube. With the egeplast webcalculator you have the possibility to make a cost comparison between different installation methods. For your project egeplast offers a range of HexelPress® fittings for installation on site by means of a hydraulic pressing tool as well as a range of HexelPress® fittings pre-fitted with a HexelOne® pipe spigot for jointing by means of a combination welding on site. Fittings are made of steel (suitable for gas applications) respectively stainless steel (suitable for water and gas application). Would you like to always be kept up to date about the HexelOne® SLM piping system and other egeplast products? 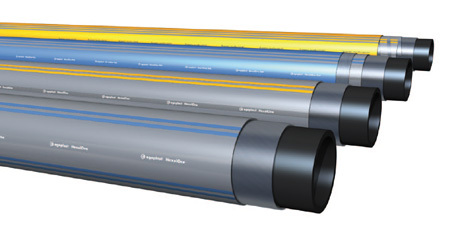 As an alternative HexelOne® pipes are also available without protective layer for open trench installation in sandbeds. Designs with metallic layers, such as DCT-, SLA®– or 3L safety pipe versions are also possible. The following documents can be downloaded in the download area or you can order them as printed version here. You are interested in the HexelOne® SLM piping system?